Historically, Elen of the Hosts was a real woman who lived in the 4th century, but in British legend and Welsh and Celtic mythology, may go back even further. She appears to have been a woman of many roles that have grown and evolved over the centuries to the present day. Read more at Folklore Thursday. This entry was posted in British, Folklore, Mythology and tagged Elen, horns, sovereignty on October 17, 2018 by solsdottir. I have been following the goddess Brigantia for some time now. I remember in 2009 a new inscription dedicated to Brigantia surfaced. (It had been previously mistranslated, but the new R.I.B. changed that.) It had been read as a dedication to the Terra Batavorum, but now it is read as Tutela Brigantia Augusta (Guardian Brigantia Augusta). 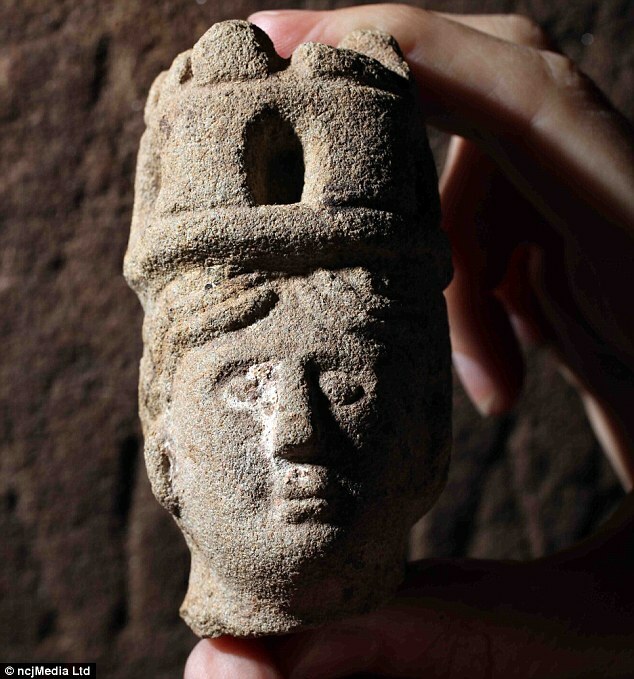 Now, however, we have a new image of the goddess, found in South Shields (near Newcastle). She still has traces of pink paint on her face, and red on her lips. So far all that has been found is her head, which is thought to date back to the second century CE (like the other dateable evidence for her cult). Head of Brigantia statuette. Photo from the Daily Mail. Brigantia as guardian is apparent in both image and inscription, as the little head wears the mural crown, which indicated that a goddess was the protector of a city or territory. The famous image of Brigantia from Scotland also has a mural crown worn outside a Minerva-like helmet. The new image of Brigantia was found at the old Roman fort of Arbeia, not too far from another altar discovered long ago. It will be exciting if they find the rest of the little image of Brigantia, but as this find and the dramatic find of Senua earlier show, the book on Roman Britain is still being written. This entry was posted in British, Romano-Celtic and tagged archaeology, Brigantia, MInerva on February 3, 2015 by solsdottir.